DISPLAY INCLUDES RARE ORIGINAL COPY OF THE DECLARATION OF INDEPENDENCE, GEORGE WASHINGTON’S FIRST PRESIDENTIAL THANKSGIVING PROCLAMATION, AND LETTERS AND DOCUMENTS OF HAMILTON, ADAMS, JEFFERSON, THE SCHUYLER SISTERS, ET AL. 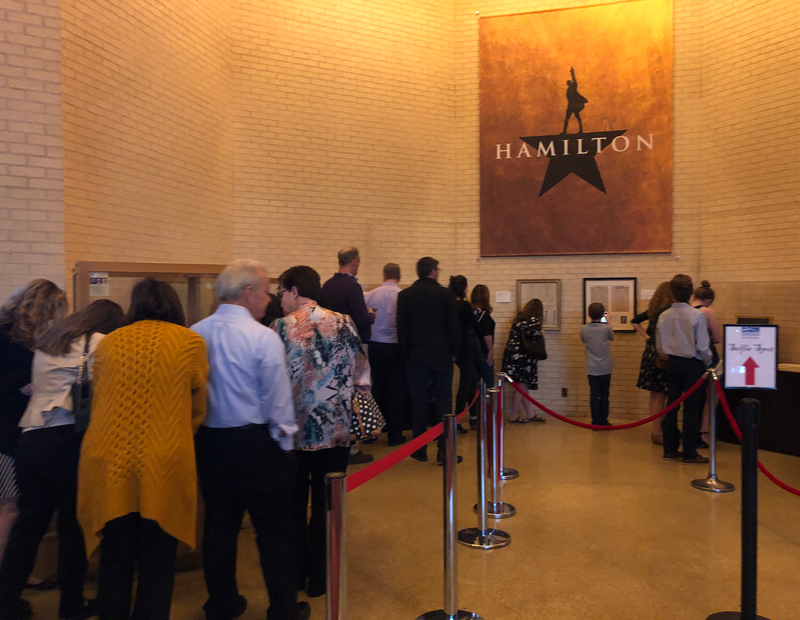 Dallas Summer Musicals (DSM), in partnership with the Dallas Public Library and Seth Kaller, Inc., welcome the public to see a collection of Revolutionary War and Founding Era documents on display at the Music Hall at Fair Park during the Dallas engagement of HAMILTON through May 5. The centerpiece of the display will be the Dallas Public Library’s rare, July 4, 1776 broadside of the Declaration of Independence. On July 4th, the Continental Congress in Philadelphia gave John Dunlap the task of printing the first copies of the Declaration of Independence. His broadsides (single printed pages with text only on one side) were distributed starting on July 5th to every colony, to major cities, and to the Continental Army. As the first publication of the Declaration, the Dunlap broadsides were relied on by other printers who continued to spread the word of Independence. There are only 27 Dunlap copies known to survive. The Dallas Public Library’s example is the only one in the western United States and one of the few that are in fine condition. Exhibit partner Seth Kaller, a leading expert on Documents of Freedom, points out that the unsigned Dunlap broadsides preceded the signed “National Treasure” document, which wasn’t penned until August, after New York changed its vote to make the Declaration Unanimous. Two items Kaller added to the exhibit relate to General George Washington’s receipt of Dunlap copies in New York on July 9th, ordering it to be proclaimed that day to his army, and also ordering a copy to be sent to Artemas Ward at the head of the army in Boston. Kaller’s Revolutionary War and Founding Collection consists of more than 1,000 original historic letters, documents, imprints and artifacts, offered together for $2.6 million. (Texts and stories of many of the letters can be seen in the collection’s electronic catalog, on www.AHamilton.com) The Dallas exhibit includes 30 pieces from that collection, along with a few documents lent from private collectors. The Thanksgiving Proclamation was on loan to The National Museum of American Jewish History in Philadelphia, where it was displayed right next to Washington’s famous “to bigotry no sanction” letter. Kaller arranged with the document’s owner and the museum to allow it to be removed temporarily to be able to share it with the people of Dallas through May 5th. The unique collection will be on display, free of charge, in the lobby of the Music Hall at Fair Park (909 First Avenue) from April 2 through May 5 during regular box office hours and during each HAMILTON performance.